Imogen (Immy) Barclay is one of the UK’s most exciting multi-lingual and hugely talented television presenters. Fluent in English, Brazilian Portuguese, Italian, Spanish and French, Immy Barclay brings a refreshingly fearless approach to television presenting coupled with a warm and personable energy. 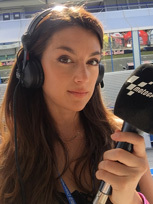 Now firmly established across Red Bull TV as the leading female motorsport and industry presenter for MotoGP across the Rookies Cup, on behalf of Sky Sports covering golf events throughout the PGA EuroPro Tour, and leading interviews at Laureus events and their partnership with Alfred Dunhill Links Championship. Immy is the perfect host and presenter for live, high profile events.